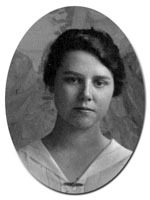 Gladys Smith came to Cornell in 1912 and received a B.S. in Home Economics in 1916. After graduation she taught at a state normal school in Farmington, Maine for one year. She returned to Ithaca and taught at Cornell as an assistant instructor from 1917 until 1918, when she became a full instructor. In addition to teaching, she conducted nutritional and dietary research on colonies of rats. While at Cornell, Smith was involved in locating "practice babies" as well as teaching food and nutrition. Smith participated in extension work in Utica and gained experience in institutional management in the Mount Holyoke College dormitories.